4-foot Open-array Radar with 40 W of Power. 4-foot, 40 W solid-state, open-array radar with pedestal. MotionScope™ technology uses the Doppler effect to detect and highlight moving targets to help avoid collisions, find flocks of birds and track weather. Pulse Compression technology provides high resolution while maximizing energy in order to enhance detection and identification of targets. Pulse Expansion setting increases target sizes to help differentiate real targets from noise. Provides radar data overlay onto charts (autopilot or heading sensor recommended). Detection range of 20 feet to 72 nautical miles. High-power 40 W Radar with Narrow 1.8 Degree Beam: You get excellent close- and long-range target detection ranging from as close as 20 feet to 72 nautical miles, even in fog or rain. Its narrow 1.8 degree horizontal beamwidth provides a high-resolution image and high antenna gain so it can pick out weak targets at a distance. The result is this radar paints a clear, concise image of the shoreline, other vessels and impending weather — right on your Garmin chartplotter. You get consistent target positions, excellent target separation and reliable operation. Its 8-bit true color imagery also helps you discriminate large targets from small ones and enhances target separation. Rotation speed of up to 48 rpm provides fast screen updates. MotionScope Doppler Technology: The GMR Fantom uses the Doppler effect to detect and highlight moving targets to help you avoid potential collisions, find flocks of birds and track weather formations. The Doppler effect is the frequency shift in the radar echo due to the relative motion of the target. This allows for instant detection of any targets moving toward or away from the radar. MotionScope highlights the moving targets on the radar display so you can navigate around other boats or severe weather — or toward fishing spots where birds are feeding at the surface. 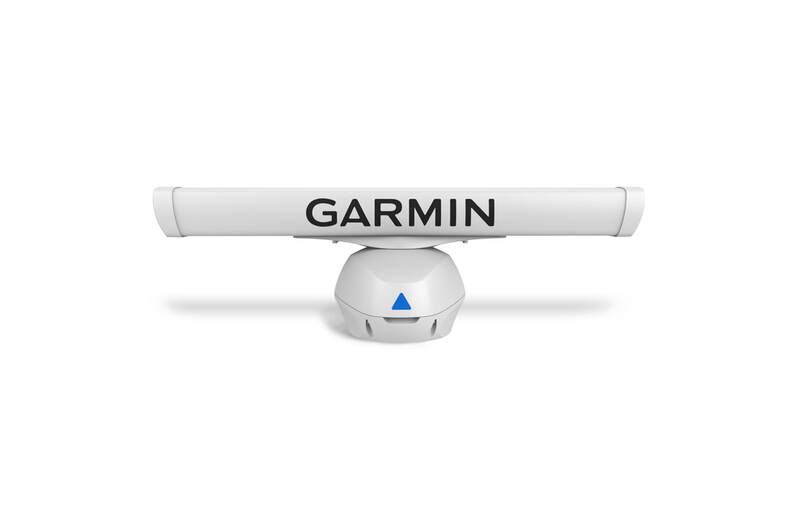 It’s Your Time: All Garmin radars are designed to be easy to install and easy to use. There are no complex user settings to adjust; just install your radar and start using it. You can rely on the GMR Fantom radar to provide reliable, optimum performance in all conditions. Because, it’s your time. Physical dimensions: Pedestal: 16.6" x 14.3" x 10.7" (42.1 x 36.4 x 27.1 cm), Full assembly: 15.9" height x 51.8" diameter (40.3 cm height x 131.4 cm diameter).